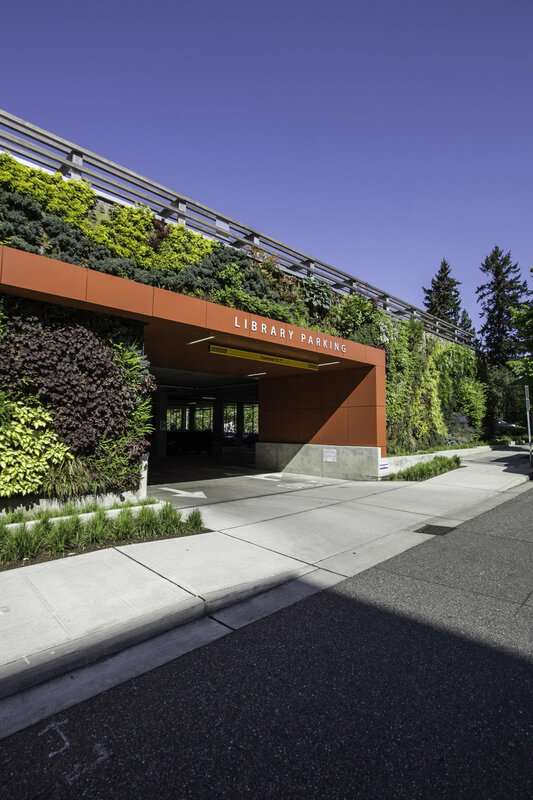 The Bellevue Regional Library Parking Garage is not just a receptacle for cars. It is also an enhancement of the existing library entry, an armature for a spectacular green wall and a home for a new piece by a local artist. This work, an assemblage of words and colloquialisms on license plates, adorns the new entry and parking garage. The 104,000 SF facility refines parking solutions and provides much needed additional capacity for the regions premiere public library. It replaces the horizontal gardens that surrounded the old parking lot with a robust vertical green wall and brilliant red canopies. Goals for integrating artwork included using an expression and medium that related to the mission of the library and the function of the garage. As a result the highlight of the project is a vertical wall of words in a composition based on the 26 letters of the alphabet. The piece is a variation on the theme of living walls, using words which are the building blocks of language and forming the portal between the library and its support system garage. The integration of artwork was extremely important to the overall design as the installation elevates the garage from a utilitarian zone to a meaningful part of the library experience. The goal of relating the art to the mission and function was also achieved by using licenses plates, which are native to all garages, as the medium. At the entrance the artist applies an intellectual set of words while inside he uses light-hearted, vernacular “vanity” phrases. These phrases, which are most suitable for text messages, seem out place in an educational institution, yet somehow seem destined to be included as words such as “selfie” and “GIF” are heralded as Oxford “Words of the Year” and added to the dictionary. The installation by renowned Northwest artist Buster Simpson is a witty comment on the relationship between the institution of the library, a home for words, and the parking facility, a home for cars. The architects and the artist worked together in an iterative process to blend the elements of structure and ornamentation. The harmony of structure, color, light, shadow, reflection, and planted elements create a surprising experience for the patrons of the library and a new landmark for Bellevue. The end result is a thought provoking composition of structure, function, art, nature and fun. The purpose of the juried awards are to recognize excellence in architectural design and planning. Congratulations to the team: Ray Johnston, Sally Roth, and artist Buster Simpson.